Hang out with the 'cool' crowd at Ice Bar Melbourne and experience sub-zero temperatures as you quench your thirst with sublime cocktails in a bar made entirely of ice. It's a winter wonderland of ice sculptures and cool music, and at minus 10 degrees it's definitely the coolest place in Melbourne! 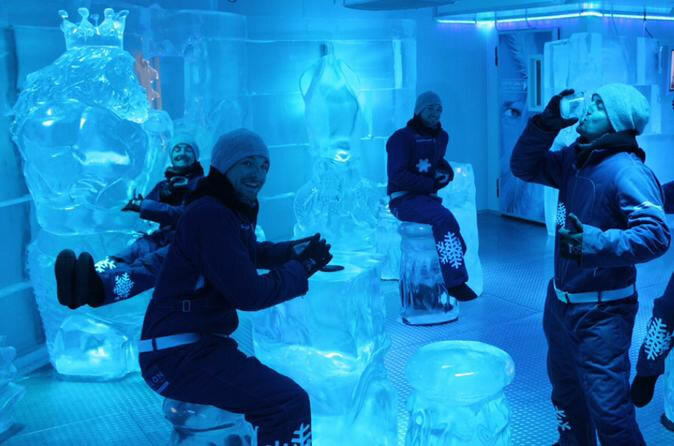 We'll get you wrapped up in a snow cape, glove and boots (where necessary) before sending you into the IceBar. Once inside you can check out our ever changing display of hand carved ice sculptures, take some memorable photos and enjoy a drink! There is no time limit for your visit, you can stay as long as you like! On average, guests feel most comfortable for around 30 minutes or so, but if you need to pop out and have a warm coffee before heading back in, that's fine with us. Open from 10am every day. Kids are welcome from 10am to 7pm. Standard $39: Cocktail, snow gear and entry. Deluxe $49: Cocktail, ice shot, snow gear and entry. Premium $59: Cocktail, ice shot, JPEG photo and entry. Premium Plus $75: Cocktail, ice shot, JPEG photo, souvenir glass and entry. Non-Alcoholic $40: Mocktail, JPEG photo and entry.